I have been quite slackened in updating my posts this week. Mainly because I have been baking everyday, till I have no time to update. Otherwise, usually I baked alternate days so that the following day, my post will be up. So now, I'm updating for the bakes that I made for this week. 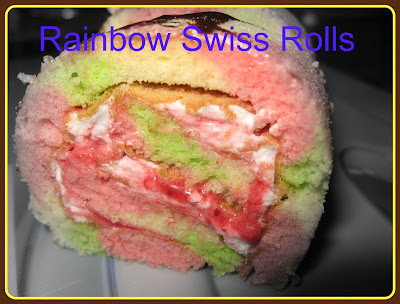 The following day, I made Rainbow Swiss Rolls. 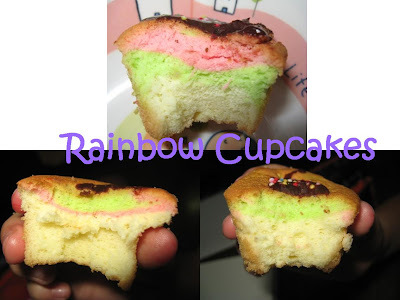 I used the emulsifier cake as the base, then separated them into three containers and added colours to two of them. As there was still half of the batter left, I made them into cupcakes and frosted them with chocolate ganache. For the swiss rolls, I filled them with whipped cream and strawberry jam. They were really good! ;) Even I like the rolls. The swiss roll is so pretty!